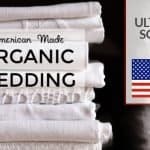 Lucky for those who are looking to reduce their grain intake or live completely gluten-free and grain-free, there are so many made in USA foods on the market that are great for Paleo lovers or those looking for paleo-friendly foods. I've tried many of them and this is a list of the very best options of paleo foods in categories like paleo bread, paleo brownies, paleo cookies, paleo pasta, and paleo pizza. Base Culture Paleo Bread is divine. 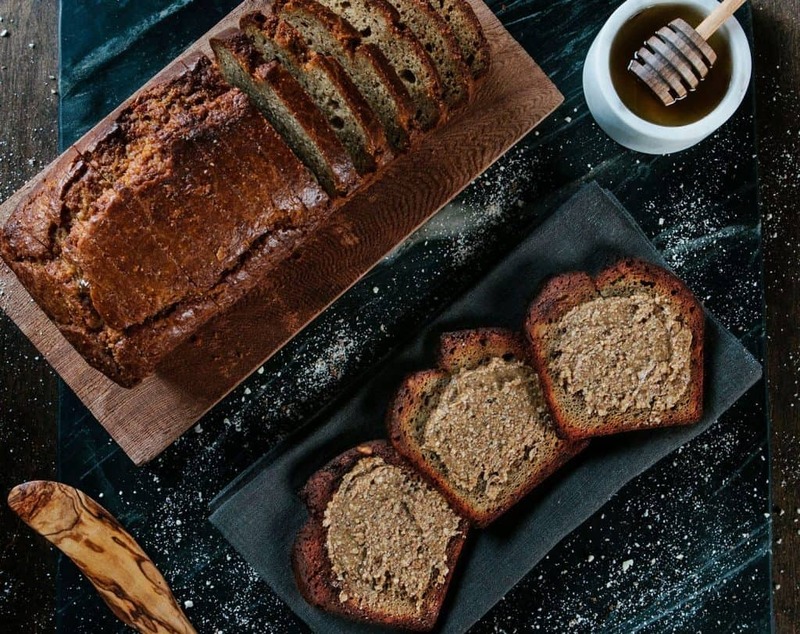 This brand makes the best paleo bread on the market. You won't even realize it's grain-free; it's that good. They offer Sandwich Bread, Banana Bread, and Pumpkin Bread. 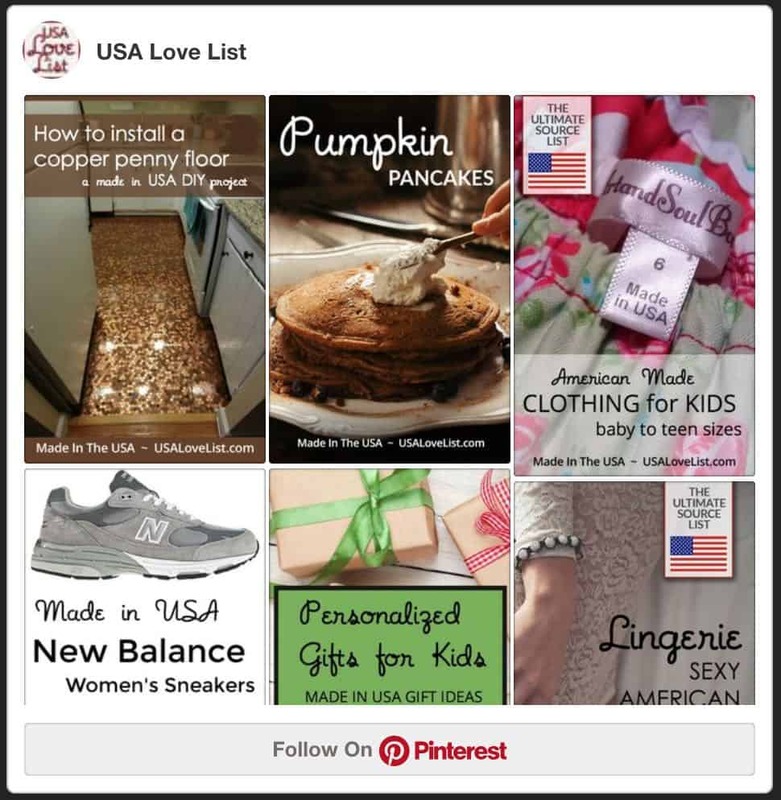 We love that Base Culture is a Women-Owned Business making paleo bread and all its other products in the USA. Birch Blenders Paleo Pumpkin Pancake Mix is surprisingly delicious. They're flavorful and filling and particularly great enjoyed with real maple syrup. I love that Birch Blenders makes a paleo pancake mix because you can enjoy a classic breakfast food without being sluggish afterward. No wheat belly or bloat here! 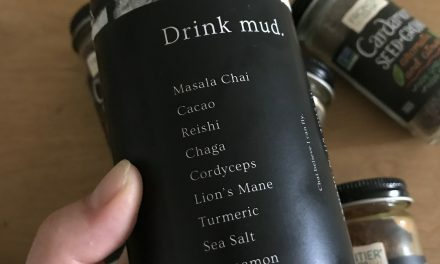 This mix is made from whole, clean, paleo ingredients including cassava flour, organic coconut flour, almond flour, eggs, leavening (monocalcium phosphate, sodium bicarbonate), salt, monk fruit, spice. This pancake mix is lactose-free, soy free, wheat free, dairy free, GMO-free, and Certified Gluten Free. Simple Mills are the best pre-made bread mixes are amazing and never disappoint! I love the pumpkin bread best out of the three options which also include banana bread and chocolate muffin mix. Soozy's already made, individual muffins are made with clean ingredients. They are gluten-, grain-, dairy-, peanut-, and soy-free muffins. They come in six flavors including, chocolate, wild blueberry, sweet potato, banana chocolate, coffee cake, and matcha green tea. They're true to flavor and the wild blueberry variety is my favorite. 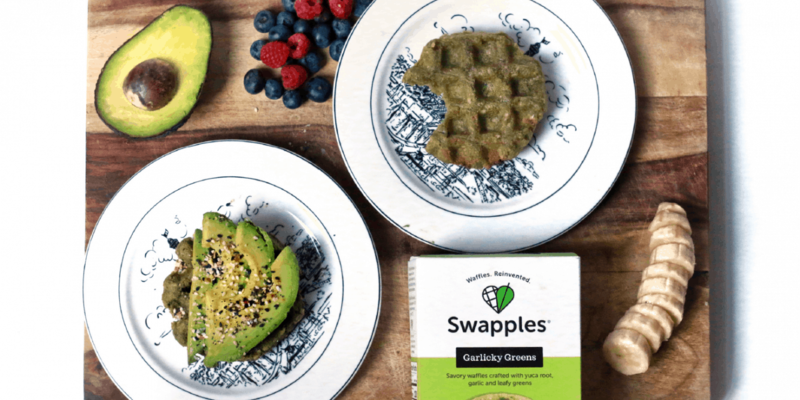 Swapples are amazing – the flavor and the texture are PERFECT! 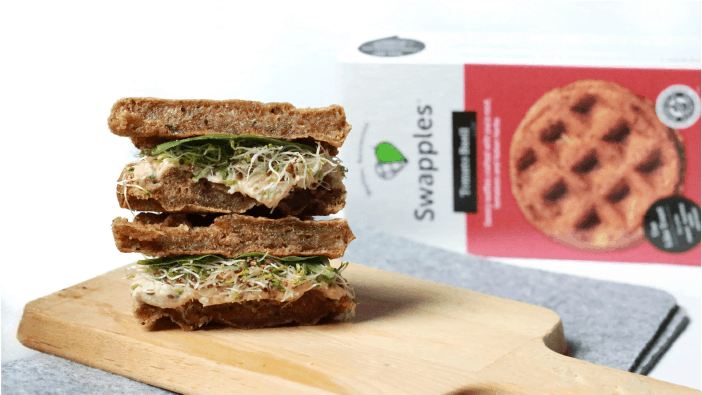 They come in five flavors – Everything, Garlicky Greens, Tomato Basil (all unsweetened) and two coconut sugar sweetened flavors, Blueberry and Cinnamon. They taste so good I was hesitant to put anything on top because I wanted to enjoy just the Garlicky Greens Swapples on its own. I ended up topping it with mashed avocado and lime which was a great compliment to the Swapples texture and taste. They come frozen and are easy to heat and serve. I don't have a microwave, so I toasted mine at 375 for about 12 minutes. 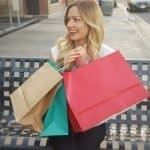 20% off Swapples with discount code USALOVE. The Real Coconut Grain-Free Superfood Tortillas Mushroom Blend have amazing texture and taste while being Paleo, vegan and grain-, gluten- and dairy- free. 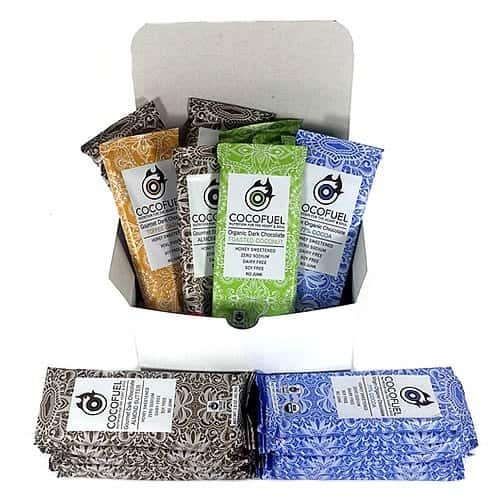 They are made with certified organic ingredients including organic coconut flour, organic cassava starch, water, organic chia seeds, organic mushroom blend (Shiitake, Reishi), organic coconut oil, salt, organic thyme, organic rosemary, and organic sage. All these ingredients are combined to promote good digestive health and wellbeing. WrawP veggie wraps, coconut wraps, and pizza crusts are raw, vegan, grain- and gluten-free. The paleo wraps are bursting with flavors, and are perfect for making sandwiches without any gluten. I love WrawP's texture too; they are chewier than regular tortillas. The veggie wrap is made with organic fruits and vegetables with spices added to complement the flavor profile of the wrap. They are handmade in California and are available in a variety of flavors. 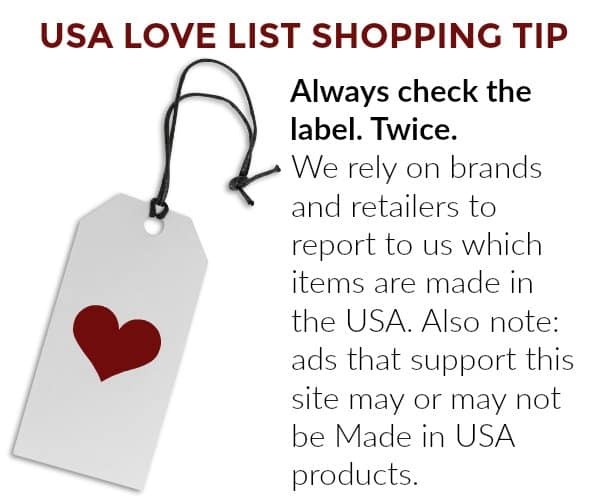 10% off WrawP with discount code USALOVE through December 31, 2019. One time use per customer. Base Culture Brownies and Blondies are everything. Base Culture makes the best grain-free brownies on the market. You won't even realize it's grain-free; they are that good. Moist, flavorful and chocolatey, these brownies are made with only clean ingredients including honey, egg, cashew butter, coconut oil, unsweetened chocolate, almond butter, cocoa powder, coconut flour, water, baking soda, cream of tartar, and sea salt. 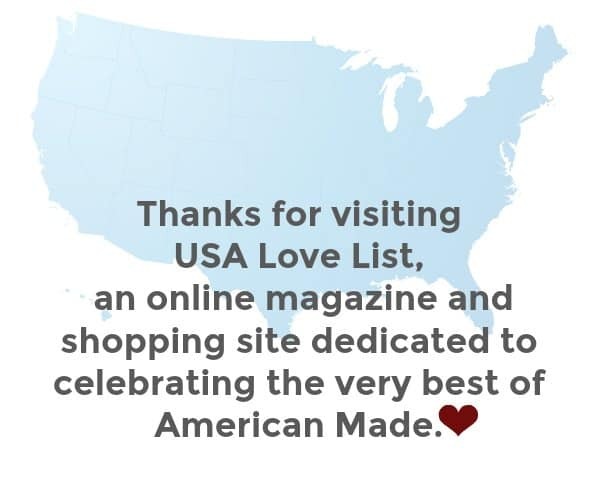 We love that Base Culture is a Women-Owned Business making all its products in the USA. COCOFUEL makes organic, Fair-Trade, honey-sweetened paleo chocolate. 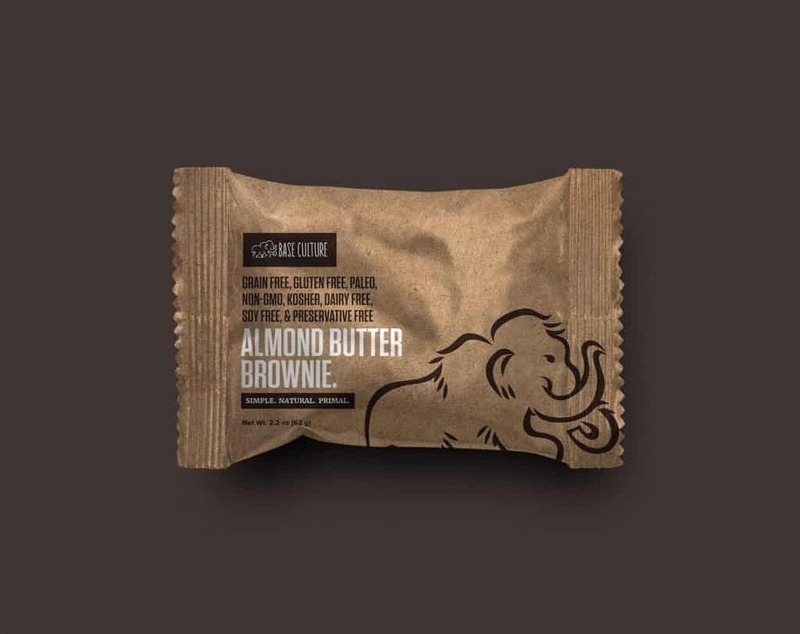 This paleo chocolate is made with only four ingredients including organic cocoa powder, organic cocoa butter, organic honey, and natural flavor. COCOFUEL is also low carbohydrate and three flavors are sodium free. 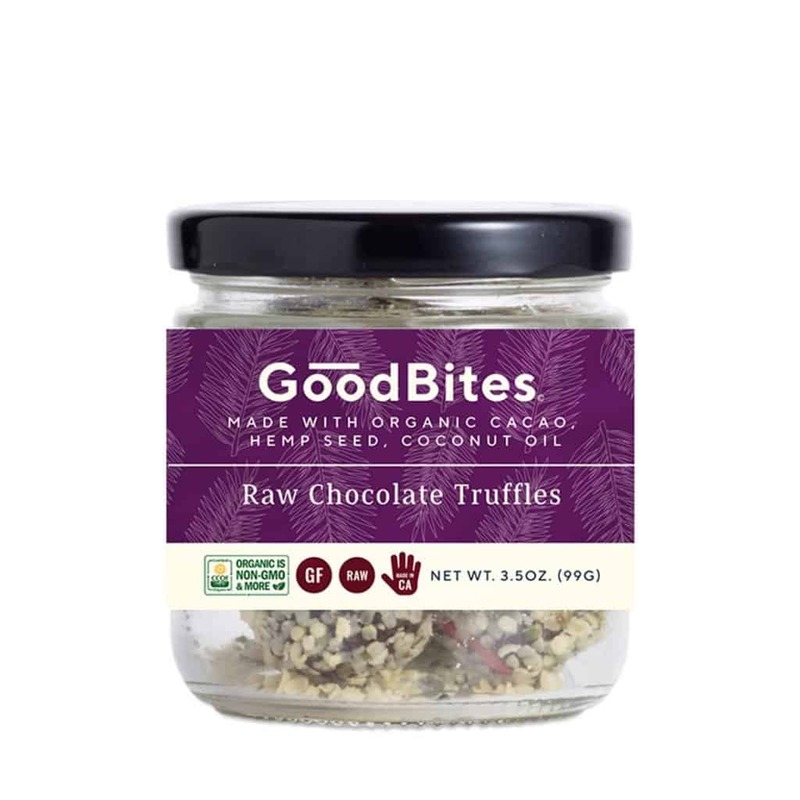 Goodbites Raw Cacao Truffles are the healthiest and most indulgent truffle I've ever had. They're handmade in California with cacao, goji berries, hemp seed, coconut oil, honey, spirulina, tocotrienols, Himalayan pink salt, and pure vanilla powder. These truffles are entirely raw, organic, vegan, gluten-free, and non-GMO. Honey Mama's makes the best chocolate I've ever eaten. I mean ever. The texture is more like fudge than like chocolate, which makes me love it even more. These honey-cocoa bars are made from five nutrient-rich ingredients. We make each of our bars from five whole foods including virgin coconut oil, cocoa powder, Himalayan pink salt, and either sprouted almonds or shredded coconut. That’s it. Honey Mama is committed to sourcing the highest quality direct–trade, non-GMO, and organic ingredients. Find them in the refrigerated section of your local organic market. HNINA Gourmet handcrafted gourmet raw dark chocolate sprouted seeds truffles. 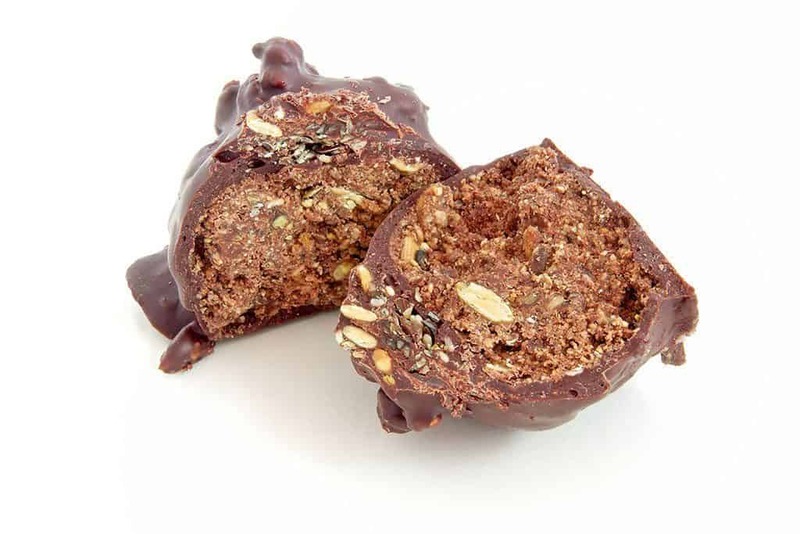 These Sprouted Seeds truffles are made with organic sprouted flax seeds, organic sprouted pumpkin seeds, organic sprouted sunflower seeds and organic sprouted sesame seeds. They have great texture, while still being delicate. Pure7 Chocolate makes super smooth dark chocolate sweetened with honey. Each bar is made with four simple ingredients including organic cacao liquor, organic cacao butter, organic cacao powder, and honey. Pure7 is GMO-, gluten-, soy-, and dairy-free with no fillers or additives of any kind. Pure7 Chocolate offers a perfectly rich, satisfying paleo chocolate. Sweet Apricity makes amazing Paleo, dairy-free, gluten-free caramels and marshmallows made with real ingredients. They’re crafted by hand in Portland, Oregon, and perfectly sized to fit in your purse or backpack. We're huge fans of the taste and texture of Sweet Apricity paleo caramels and marshmallows alike. Cappello’s Chocolate Chip Cookie Dough makes my favorite grain- and gluten-free chocolate chip cookie dough. They are worth every penny and I never regret buying them! 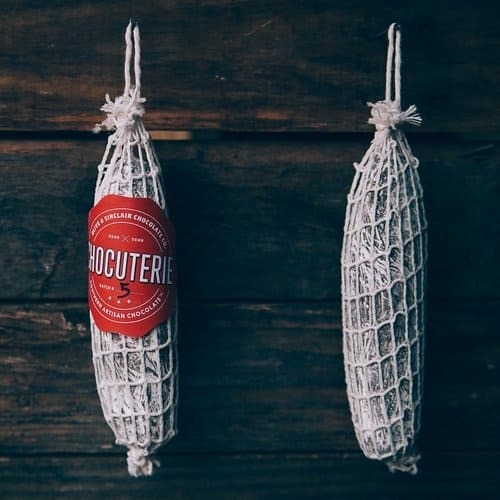 They are made with quality ingredients, and it’s obvious by the taste. I particularly love it because they are the first to offer a tasty gluten-free version of this nostalgic and iconic American treat. The dough is made from almond flour, chocolate chunks organic Grade B Vermont maple syrup, arrowroot flour, organic coconut oil, organic sea salt, organic vanilla extract, and baking soda. Emmy's Organics macaroons are the real deal. 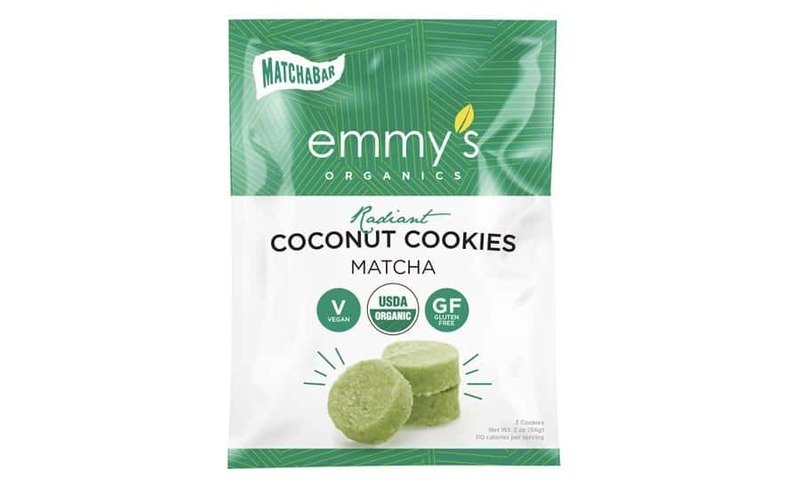 We love this brand and are huge fans of the newest product that is a collaboration between Emmy's Organics and Matchabar! They left me wide-eyed when I first tried them. Out of all the flavors, I like Matcha best for its subtle, true-to-flavor, refreshing taste. Emmy’s products are made without artificial flavors or coloring and are certified USDA organic, non-GMO, gluten-free, soy-free and vegan. Committed to transparency and using business as a force for good, Emmy’s Organics is also a certified B Corporation. Emmy’s makes its cookies in a solar and wind-powered facility that produces minimal waste, uses recyclable packaging and regularly gives back to local Ithaca organizations. Next time you spot these at your local grocery store, grab a bag (or three) to try! Go Raw Sprouted Cookie Crisps are made with just three simple ingredients including coconut, sesame seeds, and dates, combine for a decadent and sweet little cookie that unbelievably crispy, crunchy and satisfying without any refined sugar or salt. 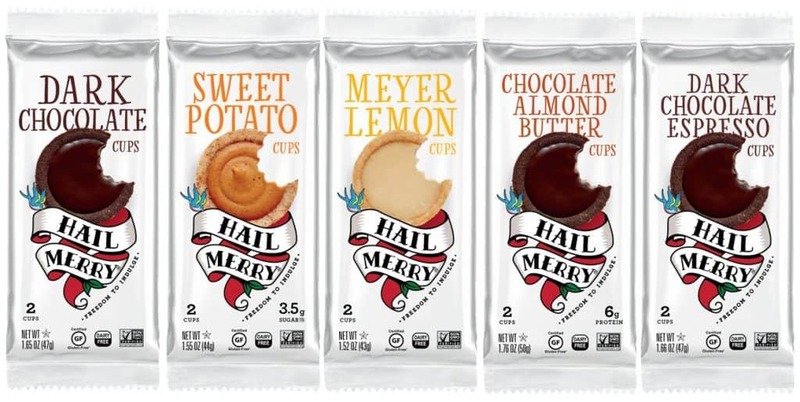 Hail Merry is one of my favorite brands for clean, tasty, Paleo-friendly desserts. You'll want to try everything they offer. My favorite product of theirs includes the Sweet Potato Tarts and Key Lime Tarts. They are GMO-free, and vegan too. Paleo Prime makes super yummy, chewy and flavorful grain-free, paleo cookies. They are made with only a few natural ingredients and available in chocolate chip, vanilla raspberry, and vanilla blueberry. Grain-free, dairy-free, soy-free and naturally gluten-free. The Real Coconut makes plantain flour cookies in chocolate chip, hemp raisin, and ginger molasses varieties. They are incredibly satisfying and I find I only need one to satiate a sweet craving. The Hemp Raisin ones are my favorite because they are a soft, crumbly cookie, packed full of juicy raisins! They are grain-, gluten-, dairy-free, organic, non-GMO, vegan and paleo. Cali'flour FOODS are very crunchy and go perfectly with paleo-friendly dips. They are grain-free, dairy-free, lactose-free, wheat-free, and soy-free! 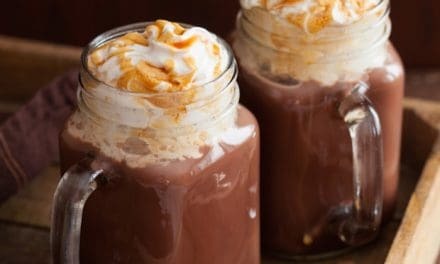 KETO friendly! Go Raw Organic Sprouted Flax Snax are made with sprouted flax seeds, sprouted sunflower seeds and sprouted sesame seeds. They are minimally-processed and packed with plant-powered, sprouted superseeds to give you the tasty nutrition and energy you need to get the most out of your day. 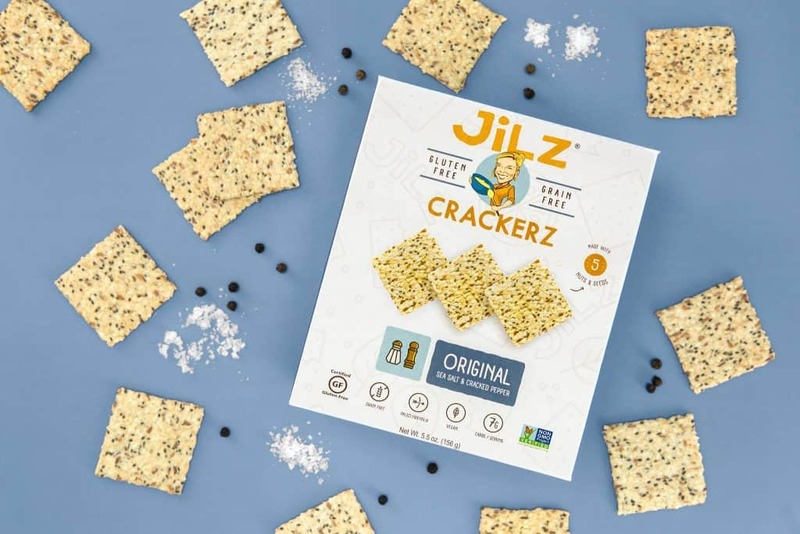 Jilz Crackerz are my favorite paleo crackers. They are super flavorful and filling. These crackers are gluten-free, GMO-Free, grain free, Paleo, and vegan crackers made in California with clean, anti-inflammatory ingredients. Siete Grain Free Tortilla Chips are amazingly delicious, so don't be surprised when you finish the entire bag in one sitting. 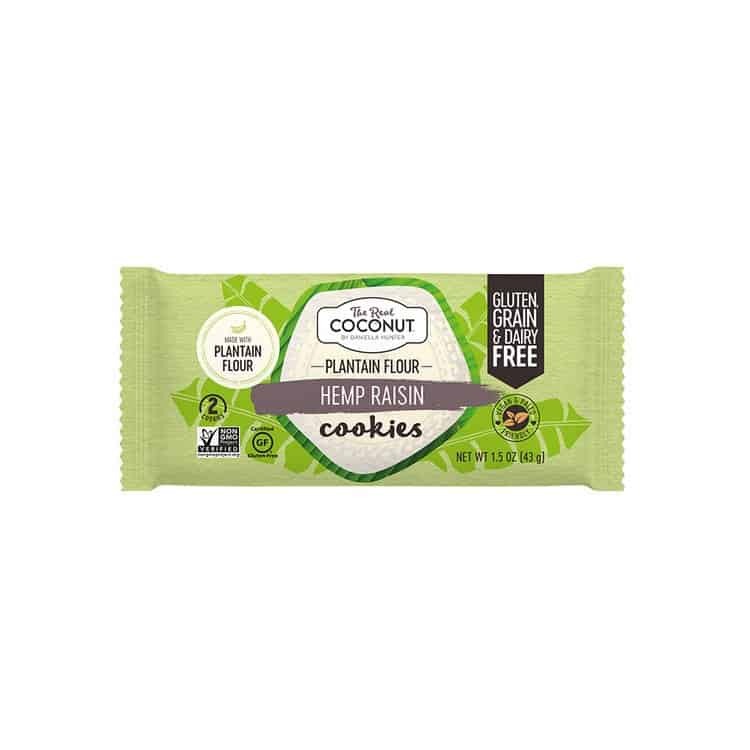 Made with simple ingredients including cassava flour, avocado oil, coconut flour, ground chip seeds, sea salt, and citric acid. 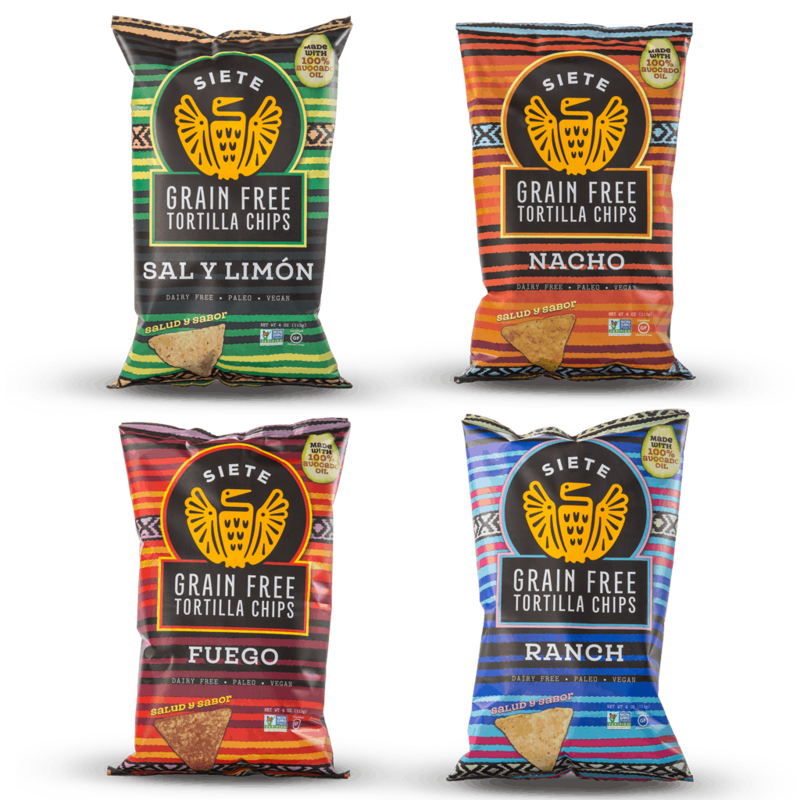 Siete chips are dairy-free, gluten-free, grain-free, paleo, and vegan. Siete Family Foods is a mission-based company, and we're passionate about making and sharing real food, gathering together in authentic community, and advocating for healthier lifestyles among Latino families. 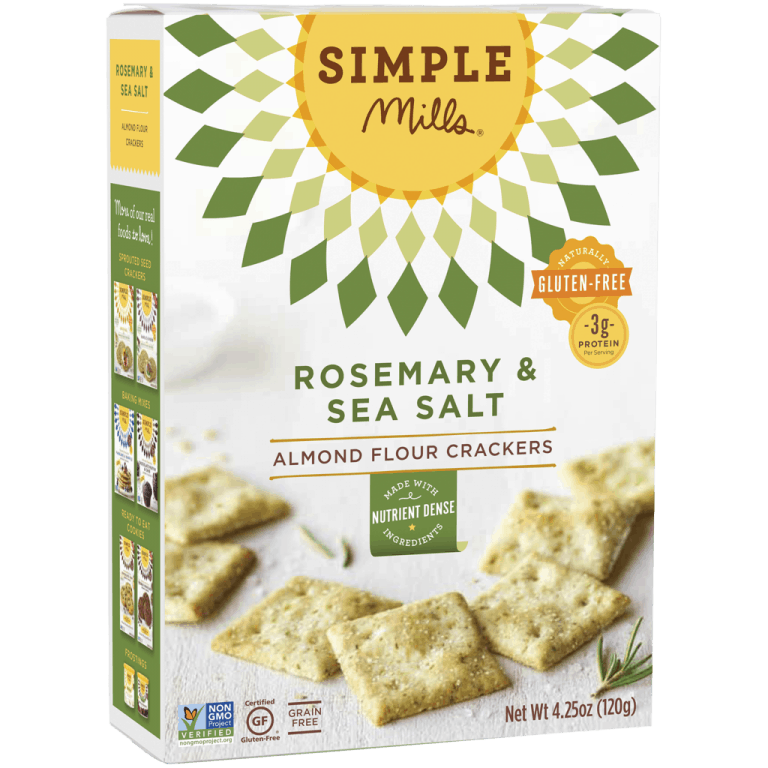 Simple Mills‘ grain- and gluten-free crackers, Paleo, vegan are my new favorite crackers. They are the best clean alternative to other crackers on the market and are bursting with flavor and the perfect crunch. The Rosemary & Sea Salt flavor happens to be one of my favorite flavors. They offer the perfect crunch for pairing with your favorite spreads. They’re made with simple ingredients, including nut and seed flour blend (almonds, sunflower seeds, and flax), tapioca, cassava, organic sunflower oil, organic rosemary, organic onion, organic garlic, sea salt, organic pepper, and rosemary extract (for freshness). Columbia County Bread and Granola handcrafts its paleo granola in five varieties in Bloomsburg, Pennsylvania. This paleo granola flaxseed based, nut-free, and vegan. 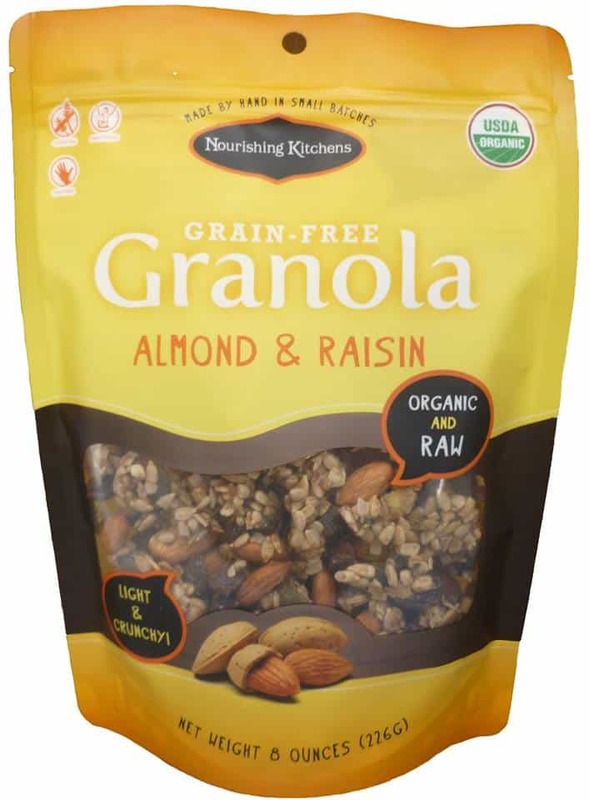 Nourishing Kitchens makes organic, raw, sprouted, grain-free granola without any added sugar. It's handmade in small batches. I love how crunchy and flavorful this granola is; it makes for the paleo breakfast. You rock my world, Paleonola! Close your eyes and put a handful in your mouth. You’d think you were eating a slice of pumpkin pie, but even better because this granola has the perfect crunch. It tastes great with almond milk. Dinos & Katelyn, the husband and wife duo, make their soy free, dairy free, gluten free, and grain free granola in Rhode Island. Wildway is the chewiest grain-free paleo granola I've tried and I'm a huge fan! It comes in eight varieties. It's made with nuts, seeds, dried fruit, and a touch of spice. There are no grains, wheat, or gluten, no added oils, no added flavorings, and no added sugars, sweeteners or extracts. .
Cappello's makes the best paleo-friendly pasta, hands down. The gnocchi are my favorite of the three pasta options. Cappello’s gourmet, grain- and gluten-free gnocchi are not only fresh and savory, they are also easy to prepare. Cappello's Sheep's Milk Cheese Pizza is the cleanest frozen cheese pizza and absolutely the best frozen pizza on the market. It's paleo, grain-, gluten-, and yeast-free. Simple Mills Pizza Dough Mix is great, easy to make and cooks fast in a cast-iron skillet. The texture of the dough is absolutely perfect and I like it better than any grain-based bread. Simple Mills makes the absolute best paleo pizza dough, simply put. 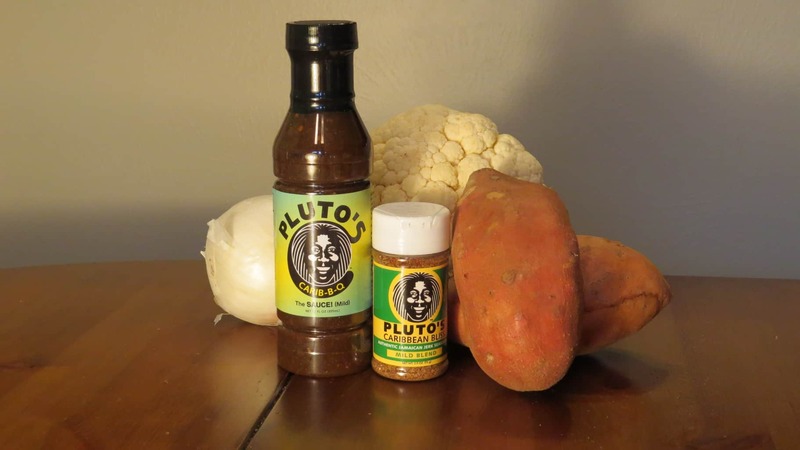 It's made with eight simple ingredients including almond flour, arrowroot, flax meal, cauliflower, baking soda, organic oregano, cream of tartar, and organic garlic. 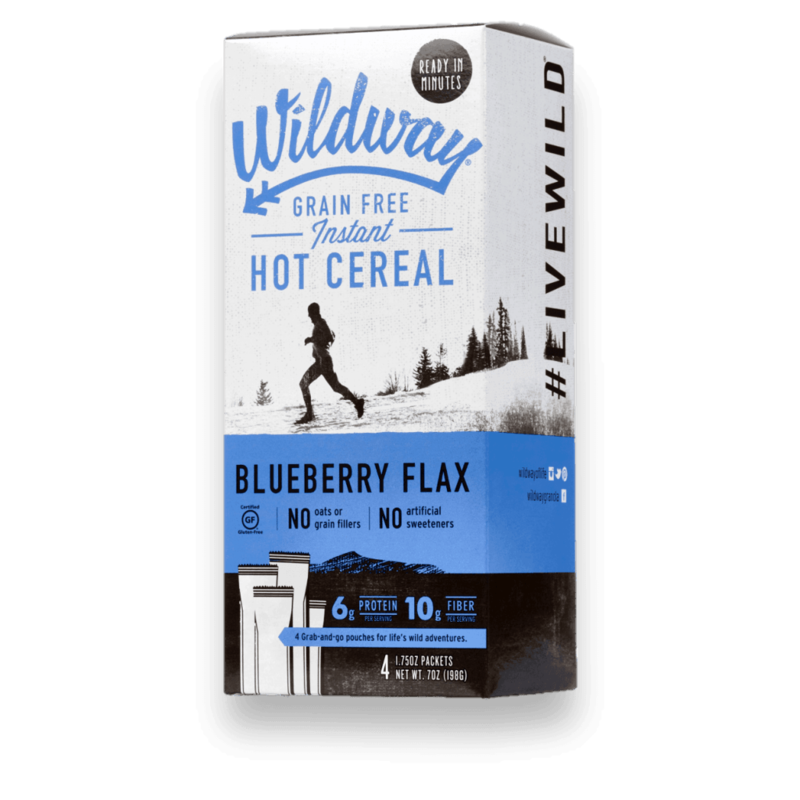 Wildway Grain-Free Paleo ‘Oatmeal' Instant Hot Cereal is my favorite! 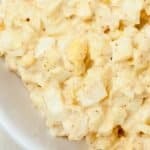 The flavor and texture is perfect and it tastes great with coconut cream and berries on top too. It's made with a base of walnuts, ground flaxseed, cashew, coconut flour, and pecans, dried dates, and vanilla bean. Wild Zora flax meal paleo breakfast is perfect for travel, camping, backpacking or breakfast on-the-go. There's no prep, dishes, or mess – just add water. 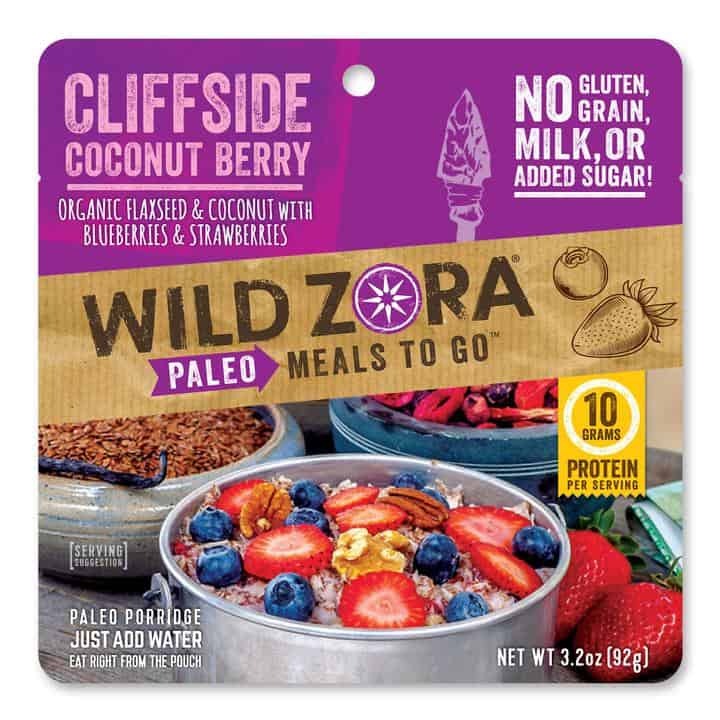 The Cliffside Coconut Berry variety is made with organic flaxseed meal, almond flour, strawberries, pecans, walnuts, shredded coconut, coconut chips, blueberries, apple, mango, sea salt, and vanilla bean. 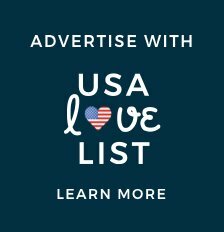 25% off Wild Zora with discount code USALOVE. One time use per customer with no expiration date.